Example: The scientist was a religious sceptic and had trouble believing God exists. Example: When the accountant was asked to contemplate the current budget, he discovered many ways the company could save money. Example: Going after the personal assets of a promoter is flagrant violation of the principle of limited liability. Example: The Insolvency and Bankruptcy Code provides a moratorium on all legal proceedings. Example: The Companies Act seeks to safeguard the principle of limited liability, albeit only for a small class of shareholders. Example: This enables manufacturers and retailers to disintermediate the supply chain and reap the benefits of economies of scale. 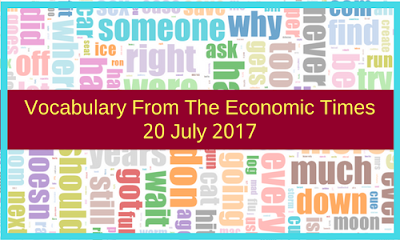 Example: This may bring a large swathe of the informal economy into the tax bracket, thereby boosting revenue collections. Example: These will eventually accrue to taxpayers through various government schemes and programmes. Example: A man with a generous heart can see the intrinsic value in something which looks worthless to others. Example: Despite an increasing number of students, the money being allotted for education continues to remain stagnant. Example: At an early age, my annoying brother seemed to have a penchant for getting into trouble. Example: Abby had to forge her words very carefully when she started to feel upset. Example: In 1993, she supported Mulayam Singh of the Samajwadi Party, but toppled him in 1995, becoming chief minister with the BJP’s support. Example: The vegetation in the desert is stark because of the area’s dry climate. Example: The bereft parents felt hopeless when they learned of their daughter’s death. Example: Drunks on free booze will have no one to shout at. Example: Anna had been chosen as the Indian of the Year for being the mascot of the anti-corruption movement. Example: And therein lies the real intrigue of AI. Example: All in all, AI is a microcosm of India’s class system, inside one airplane. Example: No tolerance for being hit by slippers when not serving a VIP to his whim.